Movie Review by Fr. Tom Condon, O.P. Arrival is the story of a human encounter with extraterrestrial creatures, much like Spielberg’s Close Encounters of the Third Kind. Without warning, twelve large objects appear hovering just above ground throughout the world, including Montana in the United States. Of course, military personnel investigate. They bring in scientists to determine who these aliens are, and why they came to earth. 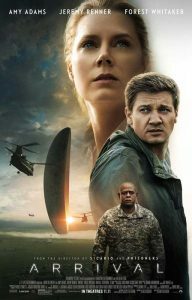 In the U.S., Dr. Louise Banks (Amy Adams), a linguist, grieving the death of her daughter to cancer, is summoned from her university position to attempt to communicate with the aliens. In addition, the military brings in mathematician Ian Donnelly (Jeremy Renner) to study the creatures. What makes Arrival distinctive among most movies is the amount of time it spends dealing with language and communication. Much of the film chronicles the attempts of Louise and Ian to communicate with the others. The aliens make sounds and draw figures. What do they mean? How can the humans help the aliens understand their words? While this isn’t exactly edge-of-your seat suspense, it is absorbing to watch, like trying to solve a puzzle. Arrival is an unusually thoughtful film. I kept waiting for the battle scenes to begin, when one or the other side attacks the other. Writer Eric Heisserer and director Denis Villeneuve are more interested in interaction between human and extraterrestrial than space battles. I suggest that it’s helpful to watch this movie with others, so you can talk about the ending. It might well leave you scratching your head. It helped me to have two friars along. Without spoiling the plot too much, I will say that their work together and encounter with the aliens impacts Louise and Ian in unexpected ways. I’ll also say that Arrival challenged my concept of time as linear. Yes, by the end the viewer will understand the reason that the spaceships came to earth. Arrival is always interesting and absorbing. I don’t think it’s a great movie. While intellectually satisfying, it’s not particularly compelling on an emotional level, and so loses its punch. Still its central theme of the desire to communicate with the other is certainly as relevant today as it ever was.